This past weekend we had perfect June weather, sunny, and in the 70's. Perfect weather to grill out and eat on the patio. I say perfect because it wasn't hot, not cold, no humidity, not windy, no bugs to speak of, not even mosquitoes. You get the picture. These are the kinds of days that you want to bottle, and pull out on a Dog day of summer, or a frosty, snowy day in January. To celebrate the perfect weather, we had some friends over and had a BBQ feast. We grilled the whole dinner, except for the Cole Slaw, which we forgot in the fridge. My husband loves to BBQ and now he has discovered the rubs for pork and chicken. Prior to using the rubs, he would marinate the chicken or pork to get flavor and tenderness from the meat. Now the rubs give you more intense flavor and tenderness in less time, juicy, sweet, and spicy. He calls the rubs, "Clean out your Pantry Rubs, ", because of the variety of spices used in each rub, one for chicken and one for pork. 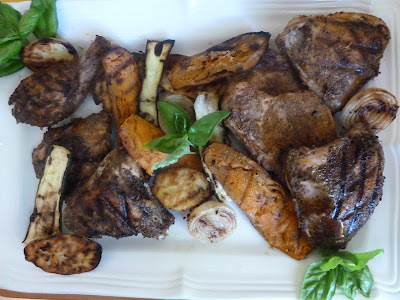 The results were amazing on the center cut pork chops, and legs and thighs from the chicken. We will definitely use the rubs again. In addition to grilling the meat, we grilled sweet potatoes, zucchini and onions with just a bit of of garlic powder and a drizzle of olive oil. You haven't lived, until you have had grilled veggies. Enjoy! Place all of the above ingredients in a shallow bowl for either the chicken or pork, and whisk until combined. Coat both sides of the chicken or pork well. Place coated meat on a covered plate and refrigerate for about 2 hours. Brush or spray grates of grill with oil.so the meat won't stick. If cooking multiple meats, like pork chops and chicken, start cooking chicken first over medium high heat, and then add coated chops 15 min. later. Grill chicken until 165 degrees, internal temp, and pork, until 145 degrees. Do not overcook. 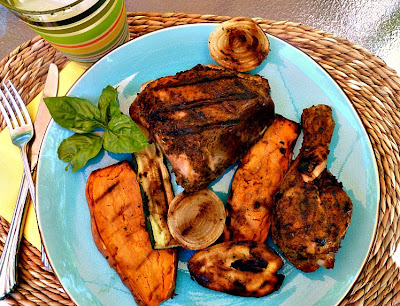 If grilling veggies, slice sweet potatoes and zucchini in fairly thick planks, about 1/2" thick, and cut onions in half. Sprinkle lightly with garlic powder, and place on grill the same time as the chops. Grill until tender. Remove to plate and keep covered, until ready to serve. ** A tip to speed up cooking the sweet potatoes, microwave sweet potatoes a couple of minutes to soften them. That way they will caramelize on the grill without burning, before they are done. Thanks for stopping by my blog. I look forward to sharing with you. Wow what a scrumptious meal and awesome photo! Everything was great grilled and the rubs were sweet, spicy, and tangy! Thank you! the meat and the veggies were outstanding. We love to grill veggies! It is nice to get outside and enjoy some great weather! Nothing makes it better than cooking outside. These pictures do convey that you had one tasty grill fest. Not only with meat but veggies as well! I like dry rubs better than wet so I am saving these two. You have inspired me to have a grill fest. Have a great day! Glad that you liked the rubs for chicken and chops. that was the first time that we had used the rubs, and we will be using them again. Lemon Ice cream for #icecreamlove!